Media interviews can be tricky if you are not properly prepared. 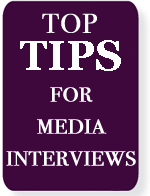 Here are our top tips for making the most of the opportunity to appear on TV or radio – even if the circumstances are difficult. Many points are also relevant to press interviews. What is the show in which you will appear? How much time do they give? Respect for interviewer – especially true for pre-recording where they control the edit! Be memorable – in the right way!